Republican presidential candidate Marco Rubio speaks during a campaign rally at Mt. Paran Christian School on February 27, 2016 in Kennesaw, Georgia. Marco Rubio has released summaries of his last five years of tax filings, revealing him to be a candidate with a senator's steady annual income of $176,000 who reaped repeated windfalls from book deals. The disclosure made Rubio the first of the top three Republican candidates to fulfill pledges to disclose their tax information. Texas Sen. Ted Cruz posted his returns on his campaign website late Saturday. The release on Saturday came with Super Tuesday looming, and Rubio and Cruz escalating their argument that Donald Trump is a conservative impostor. They tried to make the case to voters they can keep the ascendant billionaire from claiming the Republican presidential nomination. At a rally outside the Georgia Capitol, Cruz went after Trump's positions on immigration and gun control, criticized his ethics and hammered him for his frequent use of profanity. "You don't know what he's going to say," Cruz told reporters. "To the parents: Would you be proud of your children if they came home and repeated the words of Donald Trump?" Trump's tax returns, which he's said he can't release due to IRS auditing, have even been the subject of attacks, and the release of Rubio's information came with a shot at the Republican frontrunner. The Rubio Web page revealing the family's returns was titled, "Here Are Marco’s Tax Returns. Where Are Trump’s?" Speaking to reporters ahead of a rally in Little Rock, Arkansas, Saturday night, Cruz speculated that Trump could be holding back his tax information to hide exaggerations about his wealth or the support of left-leaning groups. During his first four years in the Senate, Rubio and his wife Jeanette together earned an average of $531,000 a year, according to the information released Saturday. Since winning election to an office in Washington, Rubio's income has ranged from $276,059 to $938,963, and he has paid between $46,500 and $254,894 in federal income tax. Most of the income came from a business that collected royalties on two books, which was disclosed on Rubio's personal Senate financial disclosures. In 2012, his most lucrative year, his effective tax rate topped out at a little more than 31 percent. 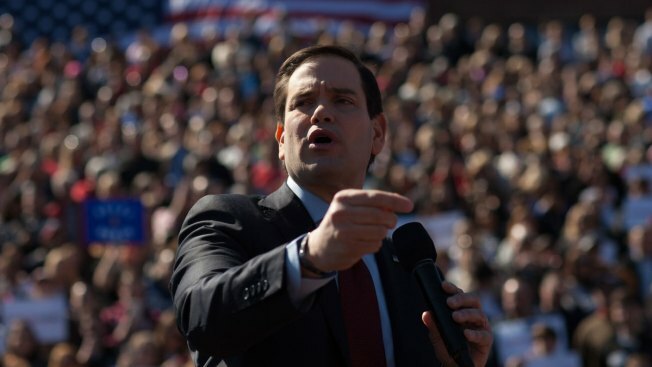 Rubio on Saturday kept up a barrage of insults aimed at Trump. Speaking at a football stadium at Mount Paran Christian School in suburban Atlanta, Rubio said Trump has "the worst spray tan in America." "Donald Trump likes to sue people," Rubio said. "He should sue whoever did that to his face." The quip drew laughs. Rubio quickly turned to immigration and kept up his criticism that the real estate mogul has employed people living in the country illegally. "I will do whatever it takes," Rubio said. "I will campaign as long as it takes." He said: "Donald Trump, a con artist, will never get control of this party." Georgia is one of 11 states that will hold GOP presidential primaries Tuesday, when 595 delegates will be at stake. Super Tuesday is the biggest single-day delegate haul of the nomination contests and, says Cruz, "the single best opportunity to defeat Donald Trump." Democrats also vote in 11 states, as well as in American Samoa. The Texas senator appealed for each supporter to get nine others to vote for him Tuesday. In Tennessee, Ohio Gov. John Kasich won the endorsement of former U.S. Attorney General Alberto Gonzales, now dean of Belmont University's law school. Gonzales was White House counsel under President George W. Bush before becoming the nation's first Hispanic attorney general in 2005. He resigned in an uproar over allegations of torture of terrorism suspects and controversy over politically motivated firings of U.S. attorneys. Kasich praised Gonzales for his work "in a very difficult time in our nation's history." "Sometimes you have to take a stand, and that's what Judge Gonzales did when he was attorney general of the United States," he said. 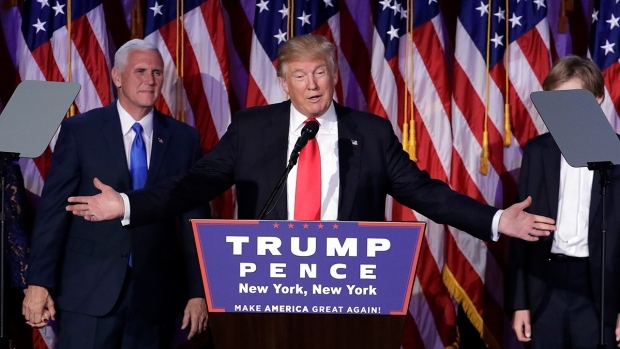 Trump, the GOP front-runner who has won three states in a row after losing in Iowa's caucuses to Cruz, held a campaign rally in Arkansas with Chris Christie, the New Jersey governor and former presidential candidate who dropped out of the race after a sixth place finish in New Hampshire. "This guy has a fresh mouth," Trump said of Rubio. He called him a "light little nothing." Their raw feud flared in the last debate, when a newly aggressive Rubio went relentlessly after the billionaire, and it hasn't subsided since. Piling on, Cruz said if Republicans nominate Trump, Americans will make Hillary Clinton the next president, a prediction that assumes she wins the Democratic nomination over Bernie Sanders. Cruz slammed Trump's past support for the Brady Bill, gun control legislation that President Bill Clinton signed into law in 1993. "Anybody who would support Bill Clinton's ban on some of the most popular weapons in America is not a committed conservative," Cruz said. Cruz supporter John Wical, of Lawrenceville, Georgia, a retired law enforcement officer, said the GOP race underscores the frustrations of many Americans but Trump's backers have settled on the wrong answer. "He's a Trojan horse," said Wical, 54. "He's just this cult of personality." He said Trump supporters are "operating on emotion." Yet if Trump goes on to win the nomination, Wical said, he would support him in November "to keep Hillary-the-liar or Bernie-the-socialist out of the White House."